If you are a fan and gear-head for volts and lighting, you have to be familiar with the guy that had a huge influence on our modern environment. This is Nikola Tesla, an immigrant from Croatia that thought beyond direct current from batteries and heated filament electric lamps. He once worked for Edison, but found him dull and uninspired. The two inventors had dramatically different styles. Edison was the plodding experimenter, who made his discoveries through a physically iterative process in physical bench tests. Tesla was the ultimate theorist, with a capacity to thing through concepts fully, before placing pen to paper, or committing to experimentation. He constructed demonstration of light, electricity, and magnetics only after being sure in his own mind of the outcome. Tesla brought the distribution of Alternating Current power to the world, and revolutionized industry and life as we know it today. He also brought advancement to lighting in the form of advancing fluorescent and metal gas discharge sources, at very near the same time that filament heating using direct current sources were being developed. Unfortunately, while Tesla was a showman (he put on some amazing demos of light and electricity) he was not the publicity hound or marketer that other inventors of the era were. 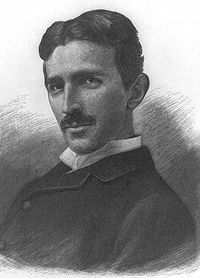 This set him up to be exploited by the likes of George Westinghouse, who essentially pushed Tesla aside to commercialize the AC inventions, without paying Tesla what was owed – which would have made Tesla the richest man in the world. Like the common crediting of the electric lamp to Edison, Marconi is widely claimed to be the inventor of the radio and radio transmission. In fact, Tesla’s patent for radio transmission, awarded in 1897, predates Marconi’s improvement patents of 1903. However, using family connections and a flair for commercialization, Marconi prevailed in recognition, while Tesla remained in the background. For anyone who interested in the fascinating period from 1800 to 1908, where the modern world was birthed on the inventors who turned us away from fire light and animal exploitation to the electric and machine age of industrialization, Nikola Tesla is someone worth investigating in detail. You will be surprised and amazed by his work, and his reclusive personality! Thanks, Kevin, for keeping Tesla “alive” and in our memory banks. He is my hero in this crazy industry of ours. We owe our very way of life to him! One of the highlights of my career (and life) was presenting a skit on Tesla with Fred Oberkircher at the 100th anniversary of the IESNA in NYC in 2006. We took that show “on the road” to Denver, Dallas, and ultimately, Mexico City. It was a blast – I hope we get to do it again one day! Tesla was one of the worlds rare, true geniuses, and must never be forgotten. Thanks for “dusting this one off” and keeping it around!